Procured daily to ensure maximum freshness! Fish is sourced directly from fishermen, chicken from licensed distributors and lamb from sheep farmers. The vendors are certified as per government norms and FSSAI. 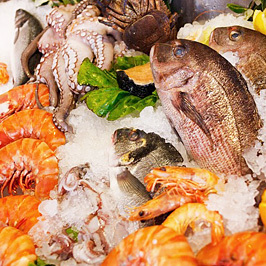 SPAR’S USP is the widest selection of fish that consumers can find under one roof. SPAR stocks about 40+ varieties of sea and river fish at each of its stores. Fin fish – katla, rohu, tangda,pabda, salmon, seer fish, king fish, pink perch, sardines, and pomfret to name a few. These are available loose as well as in pre packed form. SPAR stocks a wide range of frozen goods – both vegetarian and non vegetarian. In today’s fast paced life, frozen foods are quick and convenient to use without loss of nutrition and goodness. Products may be raw or ready to cook marinated meats. all kinds of vegetables , potato varieties, parathas, wraps and skins, ready to eat products.